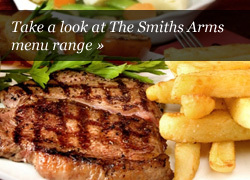 The Smiths team would like to welcome you to a fabulous Sunday Lunch at the Smiths Arms in Foelgastell. Our Sunday lunches are not to be missed as we have three different choices of meats & homemade desserts all sourced locally and cooked to perfection. In addition, we have a Nut Wellington as our vegetarian option and meet the needs of our gluten free customers. All served with a selection of vegetables, roast potatoes, parsnips and gravy. All the meats & gravy are gluten free. As our Sunday Lunch is popular it is advisable to book. Call us on 01269 842213 to book your table. Takeaways are available at £8.00 – Bring your own plate!